Oregon Rediviva | Find the Teachers—Then THINK! During the early 1920s, and the brief but frenetic heyday of the Ku Klux Klan in Oregon politics, this postcard was one small instrument of alarm and persuasion. 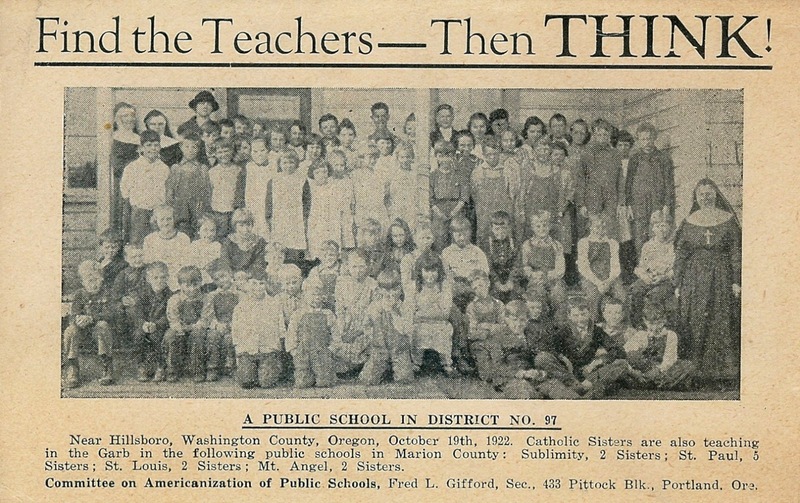 At issue in 1922 was a vote for or against a bill that would abolish private elementary and high school education in Oregon. The target: Catholic schools. The purport: “Americanization.” Other potentially affected parties: Lutheran and other religious schools, and private schools and academies. This postcard points to another fear: from a few nuns who taught in public schools. The Committee on Americanization of Public Schools was an arm of the Klan in Oregon, and its secretary, Fred L. Gifford, was the head of the Klan in the state. The law passed. It was, however, ruled unconstitutional by the U. S. Supreme Court before it went into effect. See the Oregon History Project for a biography of Gifford, and the Oregon Encyclopedia for Eckard Toy’s piece on the Klan, along with links to other ephemera and related items.